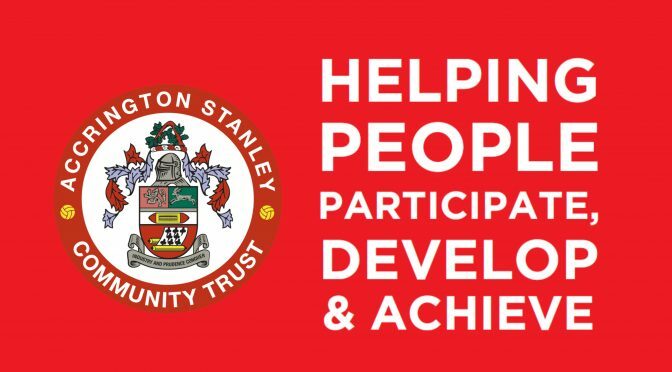 Accrington Stanley Community Trust have made a huge impact in the local area in 2018. An infographic has been created to showcase the Charity’s achievements and highlight how many people have benefited from projects in areas such as sport, health, education and inclusion. In total 17,171 people were engaged in projects, including 6,872 coming from local primary schools. 1296 free Accrington Stanley shirts were given away to all Year 3 children in Hyndburn, an initiative sponsored by the Charity. Martin Fearon, CEO of Accrington Stanley Community Trust said ‘we have had another fantastic year of delivering charitable projects in our community that make a positive difference to thousands of people. I would like to thank all of our funders and partners who have played a part in helping us achieve our aims and objectives this year. We now deliver over 30 community projects and engage with over 17,000 local people. In just eight years, the Charity has raised over £2.5million, and with this has been able to develop and deliver a varied repertoire of projects and programmes, successfully engaging a staggering 17,000 people in the last 12 months across the areas of Hyndburn, the Ribble Valley and Rossendale. 2019 is set to be another successful and exciting year with the construction of the multi-million pound Community Sports Hub Facility at Higham Playing Fields. This will be a big focus for the Charity over the next 12 months along with increasing provision in a number of different areas. NEXT Next post: February Holiday Courses – Book Your Child’s Place Now!